Including real life stories, this newly revised third edition of the award-winning bestseller--voted one of the top twenty parenting books--provides parents with the most up-to-date research, effective discipline tips, and practical strategies for raising spirited children. Do you ever wonder why your child acts the way he or she does? Are you at a loss regarding your child's emotional intelligence and how to prevent meltdowns? Do you find yourself getting frustrated and feeling like you're at the end of your rope? You are not alone! Many parents are dealing with the same challenges. In Raising Your Spirited Child, Third Edition, parenting expert Mary Sheedy Kurcinka, Ed.D, offers ALL parents a glimpse into what makes their children behave the way they do. Through vivid examples and a refreshingly positive viewpoint, this invaluable guide offers parents emotional support and proven strategies for handling the toughest times. Dr. Kurcinka has devised a plan for success with a simple, four-step program that will help you discover the power of positive--rather than negative--labels, understand your child's and your own temperamental traits, cope with tantrums and blowups when they do occur, develop strategies for handling mealtimes, bedtimes, holidays, school, and many other situations. In this third revised edition, you will find: More practical strategies to help you manage your own intensity (keep your cool) Effective discipline tips--including how to win cooperation and establish clear expectations and limits New strategies for managing the meltdowns--including how to prevent them in the future Revised tips for helping your spirited child fall asleep and stay asleep Revised tips for finding the school that "fits" your child Ideas for working with your child when he or she does not want to talk about emotions Steps to teaching your child how to be "problem solvers," work well with others, and be more flexible ... and more! 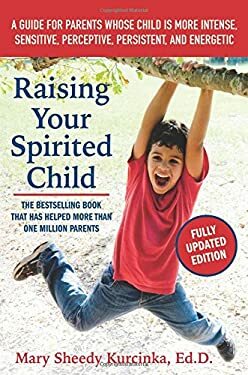 Including charts and quick tips for today's time-challenged parents, this newly updated edition of Raising Your Spirited Child will help you foster a supportive, encouraging, and loving environment for your children. New (218 available) BRAND NEW. Over 1.5 million happy customers. 100% money-back guarantee. Make your purchase count: support Better World Books' worldwide literacy partners.